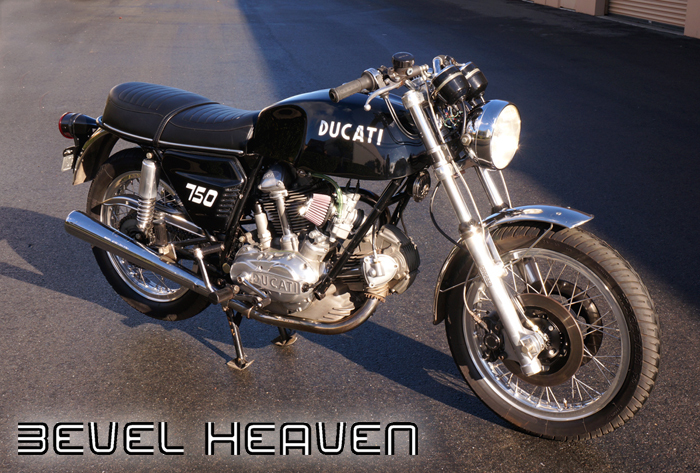 You are looking at a 1972 Ducati bevel drive 750GT in excellent condition. The bike is super clean and shiny, it is an attention grabber from all angles. When I went to pickup the bike, I rode it around a bit to check things out and verify everything worked, which it did. The previous owner liked to occasionally ride his bike and kept things in operating condition. He had ridden it a couple weeks previous to passing when I got it. The PO's brother (also a customer of mine) called me to come get it right after his brother passed unexpectedly. When I got back to my shop with it, I drained the gas out of the fiberglass tank and carbs, cleaned it up a bit and then put it on display in the entrance to the shop where it has sat since. A couple weeks ago I pulled it out and went through the carbs, as well as addressing other issues that I encountered. The work described above I personally did to get it road worthy again. The motor has very good compression and kicks over without any binding or weird noises. The transmission shifts through the gears easily. The brakes work, the inside of the carbs are perfectly clean as I just rebuilt them - everything is ready to go. This bike looks very nice - the motor is clean, covers appropriately polished, paintwork on body panels are shiny and present well. You get the bike as you see above, Clear California title with Non-Op registration in Steve Allen's name (this bike will be an easy export) plus a 1 time use 10% discount coupon for anything in stock at Bevel Heaven. You also get a folder containing receipts and notes from the previous owner. TERMS: CASH or we can go to your bank together and your bank can hand me a cashiers check. If you are an international buyer and/or unable to come see this bike in person, we can work out terms, pay a (non refundable) $1500 deposit via PayPal (use Pay Friends Or Family) then you can do a bank to bank transfer to a bank account under our control for the remaining amount due. NOTE: Concord is a 45min drive from SFO airport or 1.25 hour BART ride from SFO. If you choose to fly in to have a look, Steve can pick you up from the N. Concord/Martinez BART station and take you to it - by arrangement of course, then take you back to the BART station so you can fly back out easily. After we work out a deal on the bike, Steve can arrange shipping for you.